Innovation, transformation and disruption are the buzzwords of today. Whenever we think about how technological revolution, the emergence of newer industries such as fintech (financial technology) wave and medtech (medical technology) come to mind. Technological innovation, other than transforming the way we live and work, have also introduced new ways of solving world issues such as an ageing population. One intersection that is increasingly garnering attention is that of law and technology. Legal technology, or legaltech for short, harnesses innovations in technology to better meet the legal needs of both legal professionals and clients. The benefits of technological adoption in legal include increased efficiency, reduced risk, as well as time and cost-savings for both the provider and recipient of legal services. According to a BCG report titled ‘How Legal Technology Will Change the Business of Law’ (Jan 2016), the legal tech landscape is organised into three broad categories of solutions: 1) Enablers, 2) Support-process solutions, and 3) substantive law solutions. Enabler technologies such as cloud storage tools and cybersecurity solutions focus on facilitating the digitisation of processes. Support-process solutions allow processes ranging from customer relationship management to accounting to be managed more efficiently. The third category of substantive law solutions involves the automation of simple or repetitive legal tasks, such as contract drafting and contract analysis, as well as document screening. The majority of legal technology solutions are targeted at improving the way lawyers perform their work in firms. Technologies that facilitate or automate aspects of the legal process, from electronic discovery to legal process outsourcing, are not at all new. An example of such is Ravel Law in America, arguably leading the pack their analytics platform that aids legal research. Serving the same market at a much higher level is legal technology that employs artificial intelligence (AI). AI refers to machines that are able to comprehend natural language and put forth well-backed hypotheses to problems. In a fraction of the time, AI has the ability to sieve through pages of precedents and develop conclusions, encroaching more and more into territory that legal professionals considered to be their sole domain and area of value-add. 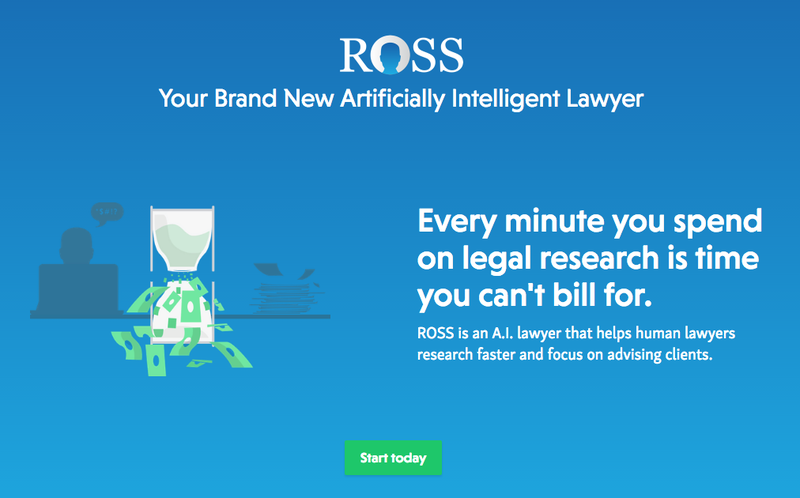 A prime example was when law firm Baker & Hostetler employed IBM’s AI Ross for its bankruptcy practice. While some fear that legal technology will replace the role of junior associates and put fresh law graduates out of the job market, experts have argued that lawyers are still considered to still have a role to play in adopting and integrating these tech solutions into their practice of the law. Apart from being a productivity and efficient tool for lawyers, technology can also be a solution for the end users – the clients themselves. The transition from conventional to online legal services has been going on for a while now. Lexoo in the UK allows small and medium enterprises (SMEs) to post their jobs and receive quotes for the job from pre-screened lawyers. In Asia, online platforms such as Asia Law Network enable the average individual to access a comprehensive network of lawyers and assess the options based on factors such as price and expertise. With increased recognition of e-signatures and the availability of the cloud as a common platform accessible to a multiplicity of stakeholders, clients are also increasingly beginning to self-service their basic legal needs. LegalZoom and Rocket Lawyer are examples of legal tech companies in the USA that helps clients better manage their legal requirements online. In Asia, Zegal provides a web app that allows clients to draft legal documents using its simple, Q&A interface. While the legal needs of a business have conventionally been regarded as a cost-centre that business owners place low on their priority list, the growing availability of online legal services has rendered legal services more cost-efficient and accessible. On the consumer front, developments include chat bots that aim to provide basic level advice and automate appeals processes – all made available online and for free. A Forbes article from more than two years ago declared that the legaltech boom had yet to begin. New developments in legal technology have arguably been slow given how most lawyers have been set in their ways. This is particularly true in less tech-savvy small firms that may find technology adoption financially challenging. Nevertheless, the industry is picking up speed. Beyond the legaltech startups cited above, there are a whole host of other startups that target the whole gamut of pain points faced by legal professionals and clients in their quest to tackle their legal needs. 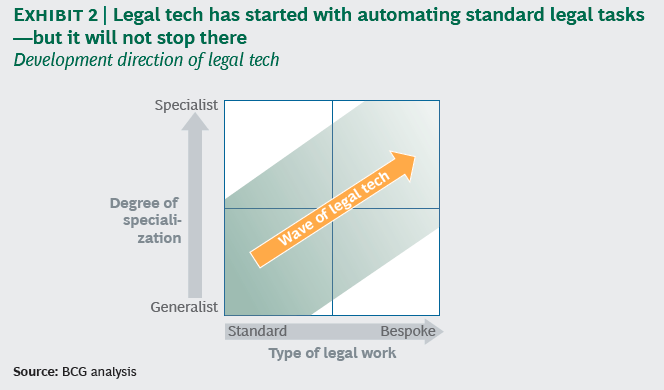 According to same BCG report, legaltech is moving past automation of standard legal tasks and towards ‘more bespoke, specialised activities done by lawyers’. This will compel law firms, both big and small, to re-examine their value proposition to clients. This, ultimately, can only be beneficial for the industry and for clients, for whom legal services will now be more within reach. Learn more about streamlining your legal processes with Zegal. Service your clients more effectively with the help of Zegal’s document automation technology. This article originally appeared on The Huffington Post. See more of Zegal in the news.